Welcome to the online portfolio of Brandon Garver. Within you can find samples of B. L. Garver's videography, graphic design and photography taken from various stages of his creative journey. 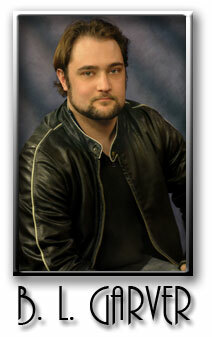 Brandon currently works as a Producer and Videographer of local television ads in Saint Joseph, MO. Brandon has been creatively oriented from a very young age. Growing up in the modest town of Everton, MO, Brandon spent his time reading, writing, drawing, playing video games, and immersing himself into all manner of imaginary worlds. Whether he was running around in the Back Forty of Grandma's farm fighting imaginary creatures with make believe laser weapons or basking in the glow of the family PC, Brandon's imagination was seldom at rest. After high school he took the opportunity to turn his make-believing into a marketable trade by earning a degree in Video Production from Missouri Western State University in Saint Joseph, MO. From there he landed the position at the local ABC affiliate. Today his time is divided between the station and working to become a professional novelist, along with the occassional short film production with friends he made in college. Brandon is 26 years old, and his interests have changed very little since his time in Everton. He is still a lover of video games, has gotten into hobby games like Dungeons & Dragons and Warhammer, and almost exclusively reads novels in the Fantasy genre. Thank you for visiting, enjoy the rest of the site!